Austral summer estimates of abundance are obtained for humpback whales (Megaptera novaeangliae) in the Southern Ocean from the IWC's IDCR and SOWER circumpolar programmes. 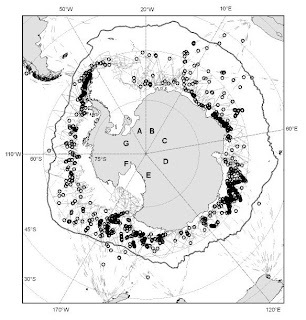 These surveys have encircled the Antarctic three times: 1978/79­1983/84 (CPI), 1985/86­1990/91 (CPII) and 1991/92­2003/04 (CPIII), criss-crossing strata totalling respectively 64.3%, 79.5% and 99.7% of the open-ocean area south of 60°S. Humpback whales were absent from the Ross Sea, but were sighted in all other regions, and in particularly high densities around the Antarctic Peninsula, in Management Area IV and north of the Ross Sea. Abundance estimates are presented for each CP, for Management Areas, and for assumed summer feeding regions of each breeding stock. Abundance estimates are negatively biased because some whales on the trackline are missed and because some humpback whales are outside the survey region. Circumpolar estimates with approximate midpoints of 1980/81, 1987/88 and 1997/98 are 7,100 (CV=0.36), 10,200 (CV=0.30) and 41,500 (CV=0.11). When these are adjusted simply for unsurveyed northern areas, the estimated annual rate of increase is 9.6% (95% CI 5.8­13.4%), near the maximum possible for humpback whales. All breeding stocks are estimated to be increasing but increase rates are significantly greater than zero only for breeding stocks D and E. If the rate of increase is >5%, total abundance in the Southern Hemisphere is greater than 50,000 and is similar to the summed northern breeding ground estimates (~53,000 from 1999­-2005). Some breeding ground abundance estimates are far greater, and others far lower, than the corresponding IDCR/SOWER estimates, in a pattern apparently related to the latitudinal position of the Antarctic Polar Front. And again in the "Total Southern Hemisphere abundance" of the "Discussion" section of the paper on page 9, Branch concludes that "...it is fairly safe to conclude that there are more than 50,000 humpback whales in the Southern Hemisphere." It should make for interesting comparison with the corresponding figure from Branch's other paper on increasing Blue whale abundance.